Reverend Yoshio Iwanaga is credited with introducing Bon Odori (盆踊り) to the Continental United States in 1930—first while visiting the Stockton Buddhist Temple which was established in 1906 by a group of Japanese immigrants. This is coincidentally the temple in my hometown. It is now an annual summer event at (Jodoshinshu 浄土真宗) Buddhist temples all across the states. The dancing in yukatas and playing of the taiko 太鼓 (drum) is always very popular for both young & old, Japanese-American & non-Japanese-American and Buddhists & non-Buddhists alike. There are also many food stalls selling chicken teriyaki, kushiyaki, corn on the cob, curry rice, udon, tempura, hamburgers, sodas & beer. Kids can enjoy playing many games and there's BINGO, a raffle and even gambling games for adults. Obon time was always one of the highlights of my summer as a kid. In high school, me and my buddies from the Stockton Buddhist Temple would pile into a car or maybe even two and make the road-trips to all the area Obon festivals (Mountain View, San Jose, Palo Alto, Sacramento, etc.). Us Stockton guys were kind of the "cool" guys (LOL) and sometimes trouble would follow us. But basically, we had friends in each city and just enjoyed seeing them, especially the girls, haha! 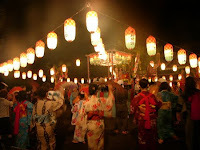 The origin of Obon is from the Buddhist observance in China; it came to Japan in the 7th Century. In general, families return to their hometowns and visit the graves of their family tombs called "Ohaka mairi(お墓参り）". Families often prepare an offering in front of their "Butsudan（仏壇）" (family altar) on the evening of August 12th. On the evening of August 13th, some will light a small fire at the gate of their home to welcome back the departed souls of their ancestors. 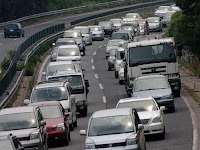 Obon is not an official Japanese holiday but from around August 13-16, many people are off from their work and return to their hometowns or travel. It is peak travel season in Japan. 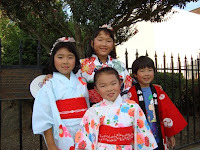 Pictures below are of my 3 nieces and 1 nephew, Stockton Obon 2009. Kristina is taking odori lessons from a private teacher. She is 8 years old and has been taking lessons for a year and performs for special occasions like the Buddhist Church Bazaar Program. Her younger sister, Kimi, who is 5 years old has also started taking lessons. I think, Obon is one of the most favorite festival in Japan. So , I think Other people expect Japanese doesn't know. But , I read this blog , my idea is mistake. Conrad's wife is very beautiful! My name is Aya Aida. 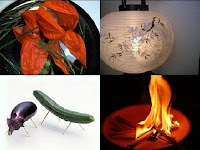 I read your report about obon. I don't go ohaka mairi in summer holiday. But I will go osyougatu. I will go to tere.